Actually, I’m not a wife, but that’s the title given me by commanding officer when she asked me to look into the clothes we were wearing in our English Civil War reenactment group. 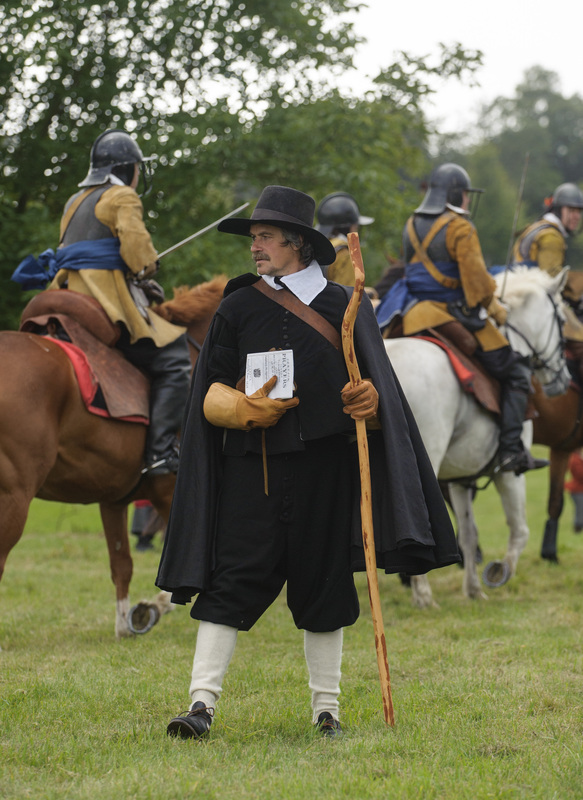 I am Ian Dicker, a reenactor and TV Cameraman and I started this blog to collect and organise as many pictures as I could find that had relevance to my hobby, the wars of England, Scotland and Ireland of the 1640s. Too many articles about this era have used European and out of period images to demonstrate what was worn in the Wars of the Three Kingdoms and I hoped that if I could stick to my remit of only posting from the correct period and geographical region that I could do something worthwhile. I think I’m beginning to succeed. Using the tags and categories on the home page, searches can now be made from more than 200 images for specific items or themes and it is possible to look at trends in a way that I believe was really tricky before I started the blog. Hope you enjoy looking through the pictures as much as I’ve enjoyed putting them together. I`m a big fan of the site and have used your pictures to help put together my kit for the Duke of Newcastle events for English Heritage this summer.During my research I have become fascinated by equestrian manuals of the time and enjoyed your recent posts on the Vaulting Master.Do you have any further info on that book? No problem Domenic. Mail me and I’ll show you what I have. Love the site. Very useful. Thanks. Ian, Re Calvarie Have you access to a copy of Militarie Instrcuctions for the Cavall’rie by Cruso?? (my copy by the Brig in 1972!) which might help?? I do have a copy thanks Chris. It’s just that there aren’t really any good costume images in the book, otherwise I’d have used it. Shallow I know, but I’m really only looking at the pictures! Just discovered this wonderful blog (searching for pictures after watching A Field in England) this is a brilliant collection of images and information. Apologies for being off-topic, but I came across this post which may be of interest. Any thoughts? Interesting and thanks for the link Brodie. I think that reenactment has its uses but has to be approached with caution. As the reviewer says such practical methods are very good when dealing with the hardware of a particular period, working out how a tool was used and what it felt like to work with it in the clothes of the period for instance. The difficulties arise when the reenactor tries to represent the values and opinions of ancient peoples without any real evidence. It is very hard to put yourself into the mind set of someone who lived 300 years or more in the past. Difficulties also arise on the practical side. We have to present some things using educated guesswork rather than research just to complete the picture. If there were no images of shoes for instance from the 1640s, the ECWS reenactors couldn’t go around with bare feet. These practical thing that are an annoyance to the academic become a real issue when recreating. A good example in my period is whether common women wore stiffened bodies under their outer garments. There is scant evidence, pictorial or in literature and the subject quickly becomes a matter for conjecture and opinion which often get presented as fact. Hello! I’m designing costumes for Caryl Churchill’s Light Shining in Buckinghampshire. I just wanted to thank you for all the great images of clothing, they’ve been incredibly helpful in my research process! The images on your site are fantastic. The Bata Shoe Museum is interested in the one called “The High Borne Prince James Duke of Yorke” showing the young man playing tennis. Please me let me know if you own the original or know of where I might find it. We’d like to use the image in an exhibition. Hi, We at MontiDots are busy creating a role playing game set during the English Civil War and though many images I shall create myself, I was wondering if I could use some from your online collection. Where used I will mention you as the source? Hi Montidots, I don’t hold copyright to any of these images, so I can’t give you any permissions and please don’t credit me with ownership! I’ve just collected them from various places for my blog posts. If you want to use them commercially, you will have to get in touch with the owners of the images, most of which are mentioned on the posts.